I was almost caught out by the rate with which the 6000-mile service approached, and only just managed to get the Tracer booked into a dealer in time for it to go on an MCN group test. Our road test team needed to cover big miles in a short time and the bike would have gone massively over the 6000-mile service interval. Thankfully Motorcycle World in Northampton were able to squeeze the bike in for the scheduled 2.1 hours of work. 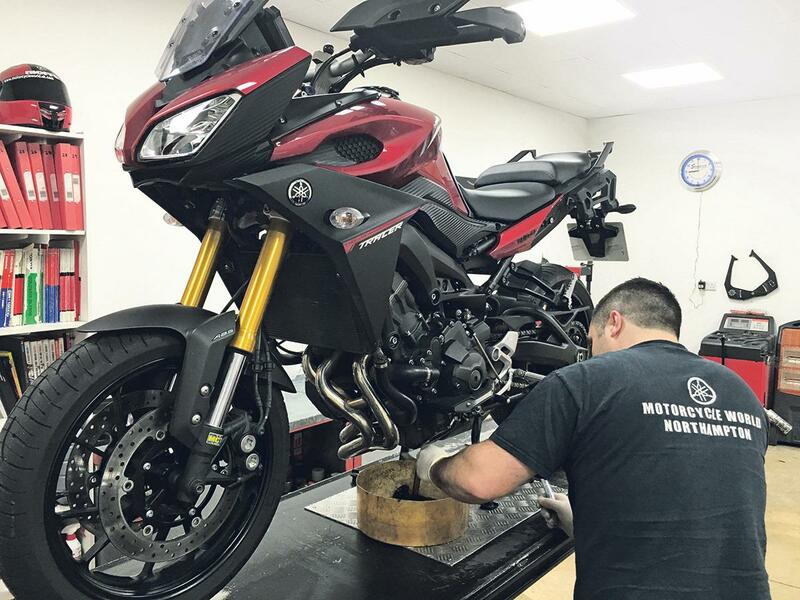 The service is a fairly simple affair that includes an oil and filter change, general check-over, clutch and brake lever adjustment and a once-over of everything else. Re-gapping the spark plugs is also on the schedule, which accounts for why it takes just over two hours. The total cost at Motorcycle World was £150. As you would expect of a Japanese bike, there were no issues with the mechanical condition and only the chain needed tightening. Watching James, the mechanic at Motorcycle World, adjust the chain revealed it’s not just me who struggles with this job on the Tracer. I’m unsure why it’s such a pain to do but I have never experienced a bike that is so sensitive to chain tension. The recommended tension specified in the owners’ manual is between 5mm and 15mm, but James suggested keeping it at 15mm to avoid a loud whining noise that appears if the slack is set at anything below 15mm. It’s also tough to get the tension to stay constant as you tighten the spindle nut to the monumentally tight 150Nm of torque. As with most bikes, the drive chain tightens as the spindle is torqued up, but it seems to be particularly exaggerated on the Tracer. What this tight torque setting has also revealed is that the spindle head is now pushing into the chain adjustment plate and slightly deforming the metal. This has led me to consider replacing the whole lot with a set of aftermarket chain adjusters.